Kent kept up the pressure on the county championship’s second division leaders after wrapping up a convincing victory by an innings and 127 runs over Sussex in the Specsavers County Championship. Their first championship win at Hove since 1992 came as Sussex’s batting caved in on the third morning as they tamely surrendered eight wickets in 27.5 overs, several of them to questionable shots. Kent seamers Mitch Claydon, Hardus Viljeon and Matt Coles took three wickets each as Sussex suffered their first championship defeat of the season to end their own slim chance of making a late charge for promotion. Sussex Head Coach Mark Davis said: “It’s very disappointing to lose with five sessions to go. The pitch was still offering some uneven bounce but losing eight wickets in a session as we did today is not good enough and the players know that. “I said at the start of the season that I didn’t want to bring in loan players. I wanted to give our youngsters an opportunity and while it’s not ideal that we’ve had to play so many young batsmen in this game, because of the injuries and unavailability we’ve had, they still need to learn from it and improve when they get these opportunities. Sussex’s hopes of making Kent work for victory depended largely on the experienced Chris Nash and Luke Wells but both fell within 30 minutes of the resumption. Nash (23) got a beauty from Viljoen which pitched and left him off the seam but Wells tried to cut a ball that he should have left alone and gave second slip Coles a head-high catch. He wasn’t the only Sussex batsman with poor judgement of balls outside off stump. None suggested they were in the mood to get their head down thereafter. 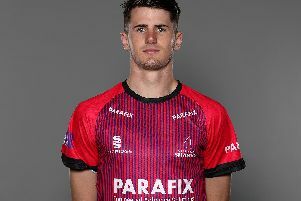 Coles found some extra bounce to have Fynn Hudson-Prentice (20) caught off the glove and Craig Cachopa (34) gave a catch by wicketkeeper Sam Billings, moving in front of first slip. Skipper Ben Brown (19) could consider himself unfortunate when he played on to a ball from Darren Stevens that hardly bounced and by then it was only a case of whether Sussex might hold on until rain arrived at lunchtime. But their tail offered little resistance. Ollie Robinson (6) guided a ball at least a yard outside off stump from Coles to third man, Danny Briggs (4) was pinned by Claydon’s nip-backer and with lunch delayed after the ninth wicket fell Claydon wrapped things up when last man Steve Magoffin (8) was caught behind. Only Nash batted for longer than an hour.